Photo for the Mirror by Roger Kerekes Central Cambria’s Matt Holsinger goes up to block a shot by Richland’s Trevy Hardison. CRESSON — Before his Central Cambria boys basketball team tipped off its District 6 Class 3A championship game with top-seeded Richland on Saturday night, Red Devil junior Matt Holsinger made a promise to his older brother Dan, a starter on the only CC team to win D6 hoops gold back in 2008. “I told him he wasn’t going to be the only one anymore,” the younger Holsinger said. Holsinger punctuated a terrific defensive performance with 12 rebounds, six blocks and a steal, while Nate Gillen provided the offense with 23 points, and Luke Bennett and Alex Persio came up big in the second half as the Devils returned to the top of the district, 54-43, at the Mount Aloysius College Athletic Convocation and Wellness Center. Central Cambria’s ninth straight win moved the Devils to 20-6. They’ll play District 3 consolation game loser Columbia on Friday at a site near home. The Red Devils certainly did that. Richland came into the game averaging 62.3 points per contest, but the Rams only got 44 shots from the field and three free throws as Central Cambria held them to 10 offensive rebounds and forced 18 turnovers — 14 of those in the first half, after which the Devils had a five-point lead they never relinquished. The only Ram to crack double digits was reserve guard Joe Hauser, who made four 3-pointers off the bench for 12 points. It shouldn’t have come as much surprise. In Central Cambria’s four playoff games, Devils’ opponents averaged 43.8 points. The Devils held Westmont Hilltop nearly 30 points below its average in the quarterfinals and Juniata 11 under its in the semis. Holsinger patrolling the middle certainly didn’t help Richland’s cause. For much of the game, the Rams were forced to be a jump shooting team, as the 6-6 Red Devil junior was a deterrent even when he wasn’t blocking shots. 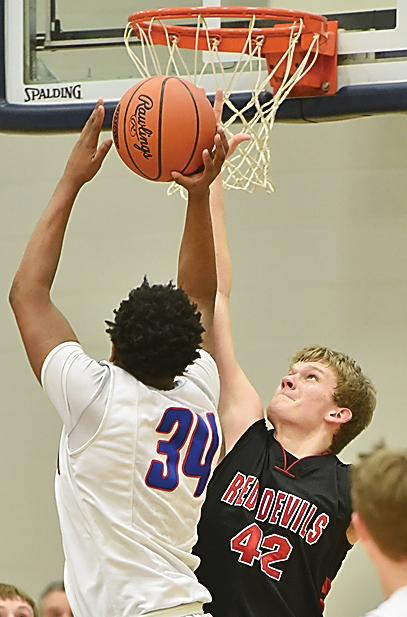 Going against Richland’s two bruising 6-3 forwards, Trevy Hardison and Collin Instone, gave Holsinger, who was averaging 13.4 rebounds and 4.4 blocks entering the contest, a challenge to which he was looking forward. “Collin Instone and Trevy Hardison are two of the best big guys in (the Laurel Highlands Conference). I always look forward to the games where we’re playing another good big guy, and I try to prove something,” Holsinger said. To make it meaningful, Gillen provided the scoring, turning in his second-best point performance of the season. He got CC going with a pair of 3-pointers after Richland scored the game’s first five points and never let up. “My teammates were just giving me the ball in positions to shoot, so I give it all up to my teammates,” Gillen said modestly after being told he scored 23 when he tried to say no one on his team had a lot of points. The game was tightly contested until Central Cambria went on a 14-0 run at the end of the third quarter and early into the fourth, expanding a 33-31 lead to 47-31 with less than 5 minutes to play. The key stretch came with 6:29 left, when Gillen was 2-for-2 at the line after a technical foul was called on Caleb Burke. Persio then made his second 3-pointer of the run on the ensuing possession, and after a Ram turnover, Gillen hit a trey to cap the spurt. Bennett also was big in the second half, scoring all eight of his points. He had six in the third quarter, including a very important foul-line pull-up to answer Zimmerman’s rim-shaking dunk that brought the Ram student section to its feet after a midcourt steal. The victory was sweet for multiple reasons for the Devils. Richland knocked them out of the playoffs last year after Central Cambria made it to states in 2015. Central Cambria defeated the Rams, 57-48, in early December, but Richland went on to win the LHAC and get the top seed in the D6-3A tournament, making it the favorite in the eyes of many. CENTRAL CAMBRIA (54): Gillen 7 4-4 23, Bennett 2 4-5 8, Davis 1 0-0 2, Bopp 2 2-4 6, Holsinger 2 5-6 9, Magley 0 0-0 0, Persio 2 0-0 6. Totals — 16 15-19 54. RICHLAND (43): Burke 2 0-2 4, Paul 2 0-0 5, Zimmerman 2 3-3 7, Instone 3 0-0 6, Hardison 4 0-0 9, Hauser 4 0-0 12, Thomas 0 0-0 0, Zheng 0 0-0 0, Felton 0 0-0 0, Bailey 0 0-0 0. Totals — 17 3-3 43. 3-point goals: Central Cambria 7 (Gillen 5, Persio 2); Richland 6 (Hauser 4, Paul, Hardison). 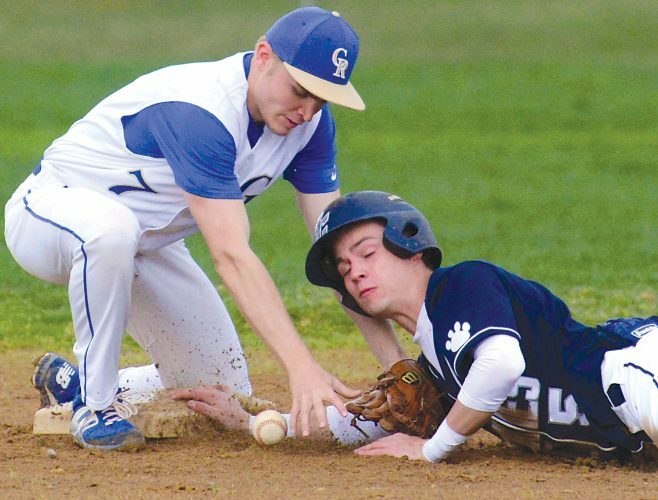 Records: Central Cambria (19-6); Richland (21-4). Officials: Sean Albright, Dave Heim, Chris Rickens.